An e-petition launched to challenge the driving of HGVs through Collingham and Pool-in-Wharfedale has been closed with almost 150 signatures. HGVs currently use small roads through the villages as a cut-through, though access to destinations is available via larger A roads. This is a real problem because this is a rural area running through the village, though it is an A road, and it is very noticeable and runs next to a school. According to the petition, which closed on March 30 while Parliament is dissolved until the general election in May, the vehicles choose to navigate narrow areas and sharp blind bends not designed for them. It said: “These small roads are not designed for HGVs and are being destroyed as a result, when the A64 and A658 are much more suitable. Harewood Coun Matthew Robinson (Con), who signed the petition weeks ago and has supported it, said: “I have been arguing with Leeds City Council (LCC) for some time about HGVs travelling along that road and I have been concerned for some residents. 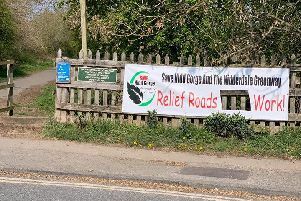 “This is a real problem because this is a rural area running through the village, though it is an A road, and it is very noticeable and runs next to a school. Coun Robinson has written to former Transport Minister Robert Goodwill and received advice that will go on the agenda for future meetings. He said: “LCC has said there are not enough HGVs using the route for it to be a problem and residents are saying there are plenty using it. We want figures from the council and to discourage vehicles from using it as a cut through. “I have been battling with the council on this. One of the things we can look to do is make sure that whatever happens there are plans that can be followed up.